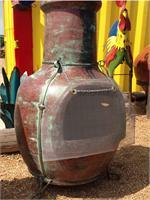 We have a lot of innovative chiminea accessories. Most are made in the USA, In our shop. There a few accessories I think shouldn't be labeled accessories but rather necessary components all chiminea users should have for safety reasons. Such as the spark screen. This is stainless steel screen that's inserted into the stack of the chiminea and it prevents hot embers flying high and landing who knows where. Then we have a spark screen that goes over the front opening. We now offer two different spark lids that fit on top of the chiminea. One lid is made in the USA and is more precision made using production machinery and these are also available in stainless steel. The other lesser expensive one is hand made- a little more rustico looking which fits the style of the clay chimineas. These are made in our shop in Mexcio. Both of these lids helps divert the heat side ways and helps prevent as much heat going up. Helpful if under trees or patio covers. If you don't see what your looking for or you have an idea of something new contact us and we'll see if we can't help make one. This is new. It's the perfect way to light your chiminea using a small propane tank. Just lay the torch head inside on a bed of sand or lava rock. The flames blow up not out the front like regular torches.Click the picture for more details. Stainless Steel Chiminea spark lid. Or rain cap. FREE DELIVERY! EVERY CLAY CHIMINEA OR CLAY POT NEEDS TO BE SEALED! This Kit contains everything you need to fire up your chiminea! 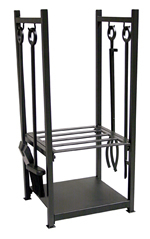 Do you need a Chiminea Stand?